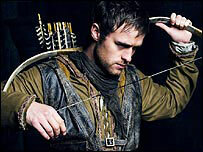 The new BBC production of Robin Hood, the classic tale of the hero who stole from the rich, has been hit by theft. A number of tapes were taken from the offices of the independent producers Tiger Aspect in Hungary, where filming of the new series has taken place. A BBC spokeswoman would not confirm reports of a £1m ransom being demanded for their safe return or that the tapes were the only copies of the series. She added: "All reasonable steps are being taken to recover the tapes." The BBC has said that the series will still be shown as planned, despite the theft. BBC news correspondent Barnie Choudhury said Tiger Aspect has described the situation as a "slight inconvenience". He said: "Either the two companies are trying to play things down or it isn't too drastic at all." The title role will be played by newcomer Jonas Armstrong, and the cast includes Keith Allen as the Sheriff of Nottingham and 19-year-old Lucy Griffiths as Maid Marian. Sam Troughton will play Robin's manservant Much. His grandfather - Doctor Who star Patrick Troughton - played Robin Hood in a 1953 BBC TV series. The characters of Will Scarlett, Allan-a-Dale and Little John will also return, but not Friar Tuck. The 13-part series - written by Dominic Minghella, brother of Oscar-winning director Anthony - is also receiving financial assistance from BBC America, the BBC's US cable channel. It will be broadcast in the autumn in the same Saturday evening BBC One timeslot as Doctor Who. Whose outlaw is it anyway?